Israeli President Shimon Peres will make various Bay Area stops Tuesday in a historic visit to the Northern California region. This is the first visit an incumbent Israeli president has made to the Bay Area. Peres is scheduled to start his day at Facebook headquarters at 9 a.m. where the president will launch his international Facebook page. 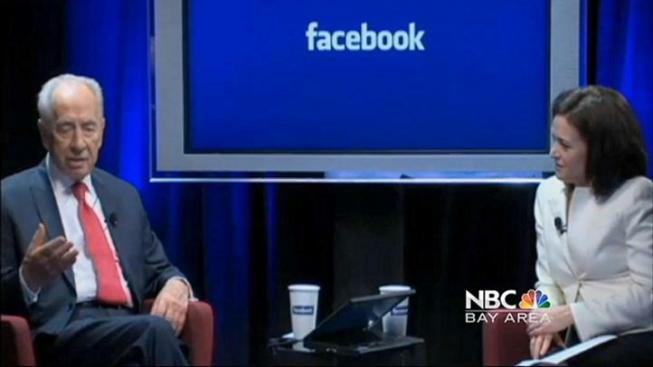 He will be accompanied by Facebook CEO Mark Zuckerberg. Following the launch, Peres will hold a live interview at the Facebook studios where he will field questions from users all over the world. The Facebook Live event will be hosted by Facebook COO Sheryl Sandberg. A livestream can be viewed online. Peres' Facebook visit will conclude with a tour of the social networking giant's research and development centers, touted as an opportunity for the company to work on relations with Israel. The location of the Facebook launch event was not disclosed. The president will be presented as a guest of honor at a luncheon at the Palo Alto Four Seasons Hotel at 12:30 p.m. The heads of various venture capitol companies, including Accel, Sequoia, and Greylock, will join the dignitary at the midday meal. During the event Peres will discuss Israel as a destination for investment and research and development. The president's day in the Bay Area will conclude with a speech at Congregation Emanu-El in San Francisco's Presidio Heights neighborhood. About 2,000 attendees, including state and city officials, are expected at the synagogue at 7 p.m. Gov. Jerry Brown and San Francisco Mayor Ed Lee will present the Israeli president the key to the City. Tickets to attend Tuesday's event are sold out. On Monday the president visited the IBM Almaden Research Center labs in San Jose and attended a dinner hosted by the chairmen and CEO of Cisco Systems. Peres will continue his Bay Area visit through Wednesday.